Ričardas Berankis with the US Open junior trophy. tennis champion Roger Federer for two weeks prior to the championship. 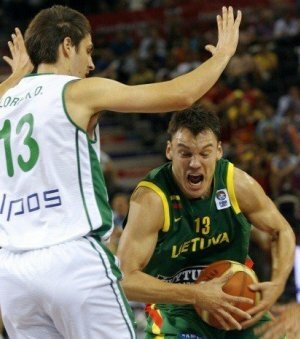 In the 2007 European Basketball Championship in Spain, the Lithuanian team reached the quarter finals without losing any matches, the only team in the competition to do so. In its first match of the semi finals last Friday, September 14, Lithuania won against Croatia in a hard fought match and it looked like the Lithuanian team would be fighting it out with Spain for the gold. However last night, September 15, they lost to Russia 86:74 and will now play Greece for the bronze. To cap it all, Lithuania’s strongman team have reached the finals in 2007 IFSA Strongman World Open Championships currently under way in South Korea.